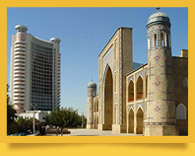 Tashkent (‘a stone city’; also spelled Toshkent), Uzbekistan’s capital, is in all respects a Central Asian regional hub; it is the fourth largest CIS city with a population of around 3 million. Today it has all the features of a modern metropolis and a capital, with a lot of attractive Central Asian-style newly-built structures and sites, as well as Soviet-era buildings. Tashkent is rich in museums, theaters and concert halls; there are a lot of traditional Central Asian and European-like restaurants and clubs, and several very nice parks, including a zoo and a huge botanical garden. Tashkent is the only Central Asian city which has an underground railway system (Tashkent Metro). It is probably one of the world’s most beautiful: its stations are real works of art, each featuring unique designs covering various themes, such as famous people, events, valued notions, terms or just common nouns. Tashkent is a city of wide streets and numerous avenues, and is abundant in trees; although it is located in Central Asia, it has recently had a lot of evergreens planted, in addition to its traditional planes, poplars, oaks, willows, etc. Tashkent looks modern - it grew to its present size mainly during the Soviet times - but it is over 2,000 years old, and there is still some of its old part surviving, called Old City or Old Town. Tashkent Old city features a huge traditional Central Asian bazaar (there are many large and small bazaars in the city; most farmer products in the city are sold through them, not through stores), as well as several Islamic architectural monuments and quaint adobe mahalla neighborhoods, quite worth visiting for their charm. The Mausoleum of Abubakr Kaffal ash-Shashi is one of the most significant cultural and architectural monuments of Tashkent, a part of the historical and architectural complex of Hazrat Imam, located in the old part of the city. Historically, the architectural ensemble of Hazrat Imam appeared thanks to the Mausoleum of Abubakr Kaffal ash-Shashi, around which there were erected new buildings, for centuries having formed the whole complex. Square and architectural ensemble received the name of Hazrat Imam (‘Holy Imam’) in honor of the famous imam, an expert on the Quran, scholar and preacher Abubakr Kaffal ash-Shashi. A walk around the Old Town in Tashkent is a bit like traveling back in time - labyrinths of narrow streets, low buildings, famous mosques and madrassas. But if you really want to dive into the past, look in the Khast Imam Square in Zarqaynar Street to the east of Chor-Su bazaar. Here is the famous Barak-Khan Madrasah. Barak-Khan Madrasah was built in the XVI century by order of the governor of Tashkent, Nauruz Ahmad- Khan a grandson of Mirzo Ulugbek. The governed considered Nauruz Ahmad-Khan ruler accompanied by good luck, that is why they nicknamed him "Barak-Khan" or "Lucky ruler." Since then madrasah is called by the nickname of its founder. 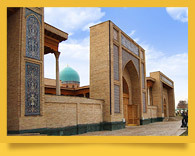 The Timurid era presented Uzbekistan a variety of unique cultural and architectural monuments. 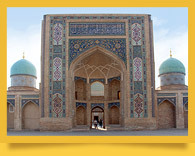 One of them is the Mausoleum of Yunus-Khan the Moghulistan in Tashkent, a most singular monument of the Timurid era. 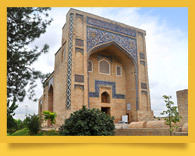 The building is located next to the Mausoleum of Sheikh Havendi at-Takhur and is included into Sheyhantaur architectural complex. 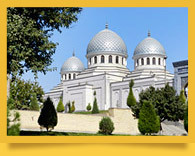 The Mausoleum is a part of the Islamic University complex. The Mausoleum of Yunus-Khan was built in the XV century and in an unusual style for Uzbekistan - khanaka. 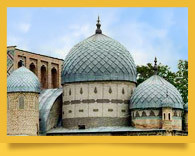 Kukeldash Madrasah is the largest madrasah and one of the most famous historical monuments of Tashkent. 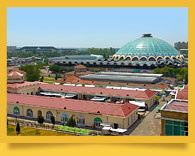 It is situated in the historical heart of the city, in the area of the Chorsu square and Registan of Tashkent. In the IX and X centuries there were Kesh gates here, one of the three city gates. The central architectural ensemble - Registan was in every big city. The buildings included in this ensemble are of refined architecture, monumentality, original idea and an unusual finish. 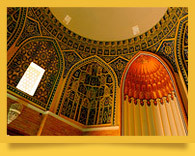 Registan of Tashkent is not an exception; it is enough to look closely at Kukeldash Madrasah. 5 kilometers away to the South from the border of modern city of Tashkent, you can get to one of the most ancient remained memorial complexes of the capital. It was formed in XIV-XIX centuries as a result of gradual extensions around the basic building - the mausoleum of Zangi-ata, an important role in erection of which played Amir Temur himself. Zangi-ata («the dark father») is a nickname which Ay-Khoja Sheikh received among the people because of the dark color of his skin. This great Sufi which had big popularity in Tashkent during his life (the end of XII - I half of XIII centuries) and has been esteemed among the people here through many centuries after the death, was the expatriate of one notable Arabian family. The old bazaar Eski Juva (‘old tower’), better known as Chorsu (‘four courses’; also spelled Chor-Su), is located in Tashkent Old City at a crossroads of four roads. It features an abundance of colorful and exotic merchandise, and, though thoroughly restored and renovated, the fascinating aura of old-time Asia and folklore all year round. It is one of the oldest Central Asian bazaars; it was known as far back as the Middle Ages as an important Silk Road destination. Just imagine yourself walking about this bazaar a few centuries ago - past merchants, packed camels, artisans, shops, shoppers. Today it is almost the same. All rights reserved. 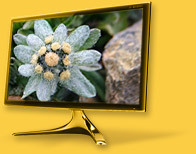 No part of these publications may be reproduced without written permission of the copyright owner.